This User Agreement ("Agreement") is an agreement between AbleTeam/Hard Drive Hotel ("Provider") and the party set forth in the related order form ("Customer") incorporated herein by reference and applies to the purchase and or usage of all services ordered/used by Customer ("Services"). PLEASE READ THIS AGREEMENT CAREFULLY. SIGNING UP FOR THE SERVICES and/or USAGE OF THE SERVICES CREATES A CONTRACT BETWEEN CUSTOMER AND PROVIDER. CUSTOMER AGREES TO BE BOUND BY THE TERMS OF THIS AGREEMENT AND ALL TERMS AND CONDITIONS INCORPORATED BY REFERENCE IN THIS AGREEMENT, INCLUDING PROVIDER'S USAGE POLICY. CUSTOMER'S USE OF THE SERVICES CONSTITUTES ACCEPTANCE OF THIS AGREEMENT. Provider's Acceptable Use Policy ("AUP") is designed to help protect Provider's customers and the Internet community from irresponsible or illegal activities and to provide a high quality of service to Provider's customers. Provider reserves the right to modify this AUP at any time, effective upon posting of the modified AUP to www.HardDriveHotel.com/tos.shtml. By purchasing the Services provided by Provider, Customer agrees to abide by this AUP as modified from time to time. If Customer violates, by the sole determination of Provider, one or more of these acceptable use policies, Provider reserves the right to suspend and/or terminate service without notice. Customer is solely liable and responsible for the use of the services and for any content that is displayed, downloaded, or transmitted through the use of the services. While our services are used to facilitate your business on the Internet, we are an independent contractor. We only have control of the products and services we provide directly, and are not liable for your actions, the actions of our third party service providers, or the actions of individuals who use your products and/or services (End Users). Provider does not host or promote any sites which contain pornographic, gambling, or "hate group" content of any type. Customer may not use the services for illegal activities or to conduct activities harmful to others, including, but not limited to: Infringement of intellectual property rights or other proprietary rights including, without limitation, materials protected by copyright, trademark, patent, trade secret, or other intellectual property right used without proper authorization. Infringement of intellectual property may result from, among other activities, the unauthorized copying and posting of pictures, logos, software, articles, musical works, and videos. Transmission, dissemination, sale, storage, or hosting material that is unlawful, libelous, defamatory, obscene, pornographic, indecent, lewd, harassing, threatening, harmful, invasive of privacy or publicity rights, abusive, inflammatory, or otherwise objectionable is in violation of this policy and is subject to immediate termination without notice or refund. Additionally, posting or sending of software and/or technical information in violation of U.S. export laws, including, without limitation, the Export Administration Act and the Export Administration Regulations maintained by the Department of Commerce is also prohibited. The following activities are prohibited on the Provider's products and services and would result in immediate termination without notice or refund. • Distribution and hosting of harmful content including, without limitation, viruses, Trojan horses, worms, time bombs, cancelbots or any other computer programming routings that may damage, interfere with, surreptitiously intercept or expropriate any system, program, data, or personal information. In the event that an account is inactivated or suspended as a result of any prohibited activities, the account may be subject to deactivation charges, reactivation charges and/or deposit requirements. Due to the administrative cost associated with violations of these policies, Provider reserves the right to make a minimum administrative charge of up to $5000 for each violation of this AUP. Accounts may be subject to other deactivation/reactivation charges and/or deposit requirements for repeated deactivations/reactivations. At times it may become necessary for Provider to examine system logs and other records to resolve system problems. Provider will cooperate with appropriate legal authorities in investigating any claims of illegal activity, including but not limited to transfer or use of copyrighted or illegal material, postings or email containing threats of violence, or other illegal activity. If Customer is aware of or suspects any violation(s) of this policy, Customer agrees to report the suspected violation to abuse@HardDriveHotel.com. Equipment Monitoring: We monitor your equipment 24/7 to verify that it is connected and functional. If we identify a problem, we will respond to it immediately. If we find that your server needs maintenance, we will contact you through emergency contact information that you have provided to us. It is the Customer's responsibility to ensure their contact information is up-to-date and for the appropriate contact. The Provider's access to monitor the dedicated server must not be removed by the Customer. Denying or locking out the provider's access to the server is in violation of this agreement and could subject your services to suspension or termination without notice or refund. Server Management: Our sole responsibilities are to maintain the equipment in good working order, provide a good network connection, and keep the operating system in proper working order. At times this will require server maintenance which requires downtime on your equipment. Any maintenance work requiring downtime will be notified to the contacts on file. At times this maintenance is emergency in nature which would require immediate action from the Provider. Additional tech support assistance is available at an additional cost. Any additional software, third party applications, etc. the customer has added to the server are the Customer's responsibility to maintain and ensure the Provider's ability to manage the hardware, network, and OS is unrestricted. Third Party Software Installs: You are free to install other software on your server. The only limitation is that you cannot use the server in a way that violates our Acceptable Use Policy above. Any software you install on your server is your sole responsibility to manage and keep up-to-date. If the Third Party Software you have chosen to install and use on the server affects other clients, your server is subject to possible suspension or termination of services without notice or refund. Backup Services: Backup services are important. Many of our customers add a second hard drive to their servers and use it to make copies of their data and/or the entire contents of their primary drive. We have remote backup options, including incremental backups, archiving, and much more available at an additional cost. Our dedicated servers are NOT backed up unless the Customer has purchased additional backup services or made accommodations for their own backup services. If the second hard drive is used in a RAID configuration for the Customer's backup services, the Provider is not responsible ensuring the backup services are running, this is the customer's responsibility. It is also the Customer's responsibility to ensure the backup copy is a viable copy (not corrupt). Equipment Monitoring: We monitor our equipment 24/7 to verify that it is connected and functional. If we identify a problem, we will respond to it immediately. If we find that your hosting account needs maintenance, we will contact you through emergency contact information that you provide to us. It is the Customer's responsibility to ensure their contact information is up-to-date and for the appropriate contact. Account Management: Our primary responsibility is to maintain our equipment in good working order, provide a good network connection, and keep the operating system and control panel in proper working order. The management of your website files including ensuring any third party applications are up-to-date is the sole responsibility of your web developer. Any problems that arise from the use of third party applications (i.e. WordPress, ecommerce software, other CMS tools, etc.) is the responsibility of the Customer and their web developer to resolve. If it is found that your website files have been hacked, the Provider may take additional action to ensure the security of other customers on the shared environment. This action could include, but not limited to, suspension of your shared hosting services and limiting access to your account. Server Access: As a shared hosting client you will have NO physical access to the shared server. Due to the nature of a shared environment, you will also not be allowed to SSH into the server. Databases, FTP uploads, plugin installs, and etc. must all be completed by FTP access. Third Party Software Installs: We do NOT allow the installation of other software on our shared servers. Password Security and Account Authorization: HardDriveHotel provides customers flexibility over their own passwords, account access and authorization procedures. Customers are responsible for selecting the appropriate authentication procedures and selecting the proper information which will be used to authenticate the account. It is the responsibility of the customer to protect the information used to authenticate their account. Account access, password security and server security are the responsibility of the customer. HardDriveHotel will not be liable for any damages, direct or indirect, that result from unauthorized account access, password compromise, or hacking. Backup Services: Backup services are important. Shared Servers are backed up daily to an offsite server. Those backups are retained for 7 days. We cannot guarantee that the contents of a website will never be deleted or corrupted, or that a backup of a website will always be available, accurate or complete. You shall have sole responsibility for undertaking measures to maintain independent archival and backup copies of your content, and for checking the accuracy of your website hosted by HDH from time to time. We have the right, but not the obligation, to make backup copies of the data you upload to our shared servers. High volume email deployment of any type is not permitted on any HardDriveHotel shared account. Customer may not distribute and /or publish the following types of email: Harassing and malicious e-mail, whether through language, frequency, or size of messages, including without limitation "mail bombing" (flooding a user or website with very large or numerous pieces of mail), "trolling" (posting outrageous messages to generate numerous responses) or posting the same or similar messages to one or more newsgroups (excessive cross-posting or multi-posting). Multi-posting is defined as posting to 10 or more groups within a two week sliding window. Additionally prohibited are emails containing forged or falsified information in the header (including sender name and routing information), or any other forged or falsified information. Any use of Provider's mail servers or another website's mail server to relay mail without the express permission of the account holder of the website is explicitly prohibited. Sending unsolicited email (SPAM) is strictly prohibited. Using any email address hosted by Provider to collect responses from unsolicited commercial email is also prohibited. All emails must abide by the current regulations of the CAN-SPAM act (http://www.ftc.gov/bcp/edu/pubs/business/ecommerce/bus61.shtm). Any Customer found in violation of the CAN-SPAM act is subject to immediate termination without notice or refund. Subscribing email addresses to any mailing list without the express and verifiable permission of the email address owner is prohibited. 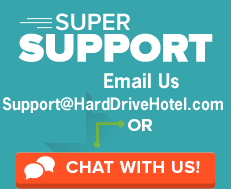 All mailing lists run by HardDriveHotel customers must be Closed-loop ("Confirmed Opt-in"). The subscription confirmation message received from each address owner must be kept on file for the duration of the existence of the mailing list. Purchasing or selling lists of email addresses from 3rd parties for mailing to or from any Hard Drive Hotel hosted domain, or referencing any HardDriveHotel account, is prohibited. Customer agrees to pay any and all fees Provider may receive from Customer's mailing activities including but not limited to Blacklists removals, bounties, etc. Activities which adversely affect the ability of other customers or systems to use Provider Services are prohibited. This includes their inability to email as a result of Black listings from other Customer's mailing activities. If the actions of one Customer adversely affect the ability of other Customers or systems to use Provider Services, the Customer originating the offensive action is subject to immediate termination. In the event that an account is inactivated or suspended as a result of any prohibited activities, the account may be subject to deactivation charges, reactivation charges and/or deposit requirements. Due to the administrative cost associated with violations of these policies, Provider reserves the right to make a minimum administrative charge of up to $5000 for each violation of this AUP. Accounts may be subject to other deactivation/reactivation charges and/or deposit requirements for repeated deactivations/reactivations. It may be necessary for Provider to examine system logs and other records to resolve system problems. Provider will cooperate with appropriate legal authorities in investigating any claims of illegal activity, including but not limited to transfer or use of copyrighted or illegal material, postings or email containing threats of violence, or other illegal activity. If Customer is aware of or suspects any violation(s) of this policy, Customer agrees to report the suspected violation to abuse@HardDriveHotel.com. 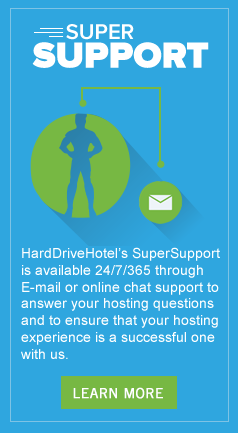 5) HardDriveHotel – Term; Termination; Cancellation Policy. The initial term of this Agreement shall be as set forth in the Order Form (the "Initial Term"). The Initial Term shall begin upon payment of the Services by the Customer. After the Initial Term, this Agreement shall automatically renew. ADDITIONALLY AFTER THE INITIAL TERM, CUSTOMER ACKNOWLEDGES, AGREES AND AUTHORIZES PROVIDER TO AUTOMATICALLY BILL AND/OR CHARGE ON CUSTOMER'S CREDIT CARD FOR SUCCESSIVE TERMS OF EQUAL LENGTH AS THE INITIAL TERM, UNLESS TERMINATED, CANCELLED, OR CHANGED BY EITHER PARTY AS PROVIDED IN THIS SECTION. The Initial Term and all successive renewal periods shall be referred to, collectively, as the "Term". This Agreement may be terminated: by either party by giving the other party thirty (30) days prior written notice. Additionally the agreement may be terminated by the Provider in the event of nonpayment by Customer, by the Provider in the event of Customers fraudulent SPAM activities and by Provider, at any time, without notice, if, in Provider's sole and absolute discretion and/or judgment, Customer is in violation of any term or condition of the this Agreement and related agreements, or Customer's use of the Services disrupts or, in Providers sole and absolute discretion and/or judgment, could disrupt, Provider's business operations and/or Provider's client's business operations. Early Termination – If Customer cancels this Agreement, upon proper notice to Provider, prior to the end of the Initial Term or any Term thereafter, Customer shall be obligated to pay all fees and charges accrued prior to the effectiveness of such cancellation; Customer shall be obligated to pay one hundred percent (100%) of all charges for all Services for each month remaining in the Term. Any cancellation request shall be effective thirty (30) days after receipt by Provider, unless a later date is specified in such request. All account cancellation requests are subject to an early termination fee. Provider may terminate this agreement without penalty, if the Services are prohibited by applicable law, or become impractical or unfeasible for any technical, legal or regulatory reason, by giving Customer as much prior notice as reasonably practicable; or immediately, if Provider determines that Customer's use of the Services, the website or the Customer Content violates any Provider term or condition, including this AUP, Dedicated Server Policies, Shared Hosting Policies, and Email and Spam Policies. Customer acknowledges and agrees that Provider may pre-charge Customer's fees for the Services to its credit card supplied by Customer during registration for the Initial Term, and/or to any credit card supplied thereafter. CUSTOMER ACKNOWLEDGES, AGREES AND AUTHORIZES PROVIDER TO AUTOMATICALLY BILL AND/OR CHARGE ON CUSTOMER'S CREDIT CARD FOR SUCCESSIVE TERMS OF EQUAL LENGTH AS THE INITIAL TERM, UNLESS TERMINATED OR CANCELLED BY EITHER PARTY. Customer will pay to the Provider the service fees for the Services in the manner set forth in the Order Form. Provider may increase the Service Fees in the manner permitted in the service description and at any time on or after expiration of the Initial Term by providing four (4) days prior written notice thereof to Customer. The Service Fees do not include any applicable sales, use, revenue, excise or other taxes imposed by any taxing authority with respect to the Services or any software provided hereunder (excluding any tax on Provider's net income). All such taxes will be added to Provider's invoices for the fees as separate charges to be paid by Customer. All fees are fully earned when due and non-refundable when paid. If any check is returned for insufficient funds Provider may impose a minimum processing charge of $25.00. Wire transfers will be assessed a minimum $35.00 charge. There may be a minimum $35.00 charge to for all credit card chargebacks. Unless otherwise specified, all fees and related charges shall be the due date of the invoice. If any invoice is not paid within seven (7) days after the due date of the invoice, Provider will charge Customer a late fee of 10%. In the event that any amount due to Provider remains unpaid after such payment is due, Provider, in its sole discretion, may immediately terminate this Agreement, and/or withhold or suspend Services. Untimely payment of any and all amounts due may result in account suspension and/or cancellation. If an invoice is not paid within fifteen (15) days after the due date, an automatic account suspension of your account will occur. If an invoice is not paid within thirty (30) days after the due date, termination of your account will occur. If this occurs, Provider accepts no liability for lost website traffic, lost email, or any other business interruption including but not limited to potentially lost revenue, termination of website files, programs, databases, and/or client files. There may be a minimum $50.00 charge to reinstate accounts that have been suspended or terminated. If Provider collects any payment due at law or through an attorney at law or under advice there from or through a collection agency, or if Provider prevails in any action to which the Customer and Provider are parties, Customer will pay all costs of collection, arbitration and litigation, including, without limitation, all court costs and Provider's reasonable attorneys' fees. In the event that an account is inactivated or suspended as a result of any prohibited activities, the account may be subject to deactivation charges, reactivation charges and/or deposit requirements. Due to the administrative cost associated with violations of these policies, Provider reserves the right to make a minimum administrative charge of up to $5000 for each violation of this AUP. Accounts may also be subject to other deactivation/reactivation charges and/or deposit requirements for repeated deactivations/reactivations. We are not liable to release domain names or unsuspend hosting upon chargebacks. Come join our winning team and help us bring the best customer service and offerings to our customers.